This article describes and analyses a simple narrow band current balun using coax line sections. From (Duffy 2010) [a] good current balun will ... deliver approximately equal currents with approximately opposite phase, irrespective of the load impedance (including symmetry) . The balun type does not seem to be formally named, nor is it clear who invented it, but it appears the earliest description might have been by Gianfranco Sinigaglia (I4BBE) in the early 1970s. It has been regurgitated in a recent QST article (Silver 2012) quoting W3LPL as enthusiastically saying [i]t's one of my favourites and nobody seems to know about it... its easy to construct and works great . From Internet postings, it would appear to be mentioned in the latest ARRL Antenna Handbook (Ed 22). (SIlver 2012b) attributes the balun to WA0RDX who described the balun in an article in Ham Radio May 1977, but this would seem to be some years after Sinigaglia's description. Silver assigns the name quarter-three-quarter wave (Q3Q) balun . So, how does it work, and how well does it work? The balun is developed on two basic elements, the half wave line and the quarter wave line. The relevant properties of each are explored and then the current balun is constructed from the parts. Fig 1 above shows a half wave transmission line. It can be shown that for a lossless half wave line, the voltage out of the line (Vo) is equal to the voltage in to the line phase shifted by 180° (ie Vo=-Vi) independent of the load impedance (Duffy 2012). Lossless lines do not exist in the real world, but short sections of low loss lines will deliver almost ideal results. For example, using TLLC to find Vo/Vi for a half wave of LMR400 with a load of 100+j0Ω at 144MHz we get Vo/Vi=9.975e-1∠-180.0°, less than 3% departure from ideal. Note that this device is very popular in its own right as a voltage balun, particularly on VHF. Fig 2 above shows a quarter wave transmission line. It can be shown that for a lossless quarter wave line, the current out of the line (Io) is equal to the voltage in to the line divided by Zo phase shifted by 90° (ie Io=(Vi/Zo)∠-90°) independent of the load impedance (Duffy 2010). Lossless lines do not exist in the real world, but short sections of low loss lines will deliver almost ideal results. For example, using TLLC to find Io/Vi for a quarter wave of LMR400 with a load of 25+j0Ω at 144MHz we get Vo/Vi=1.998e-2∠-89.9°, less than 1% departure from ideal. Fig 3 shows the combination of two quarter wave lines and a half wave line to form the balun. Obviously, if the same line type is used for all parts, there is no need for the break on the right hand side. The key thing is that since the current from the quarter wave sections is a function of Zo and Vi, and we deliver inverted Vi to one of the quarter wave sections using the half wave line section, then the current out of one quarter wave section is equal to the current into the other independent of load impedance. 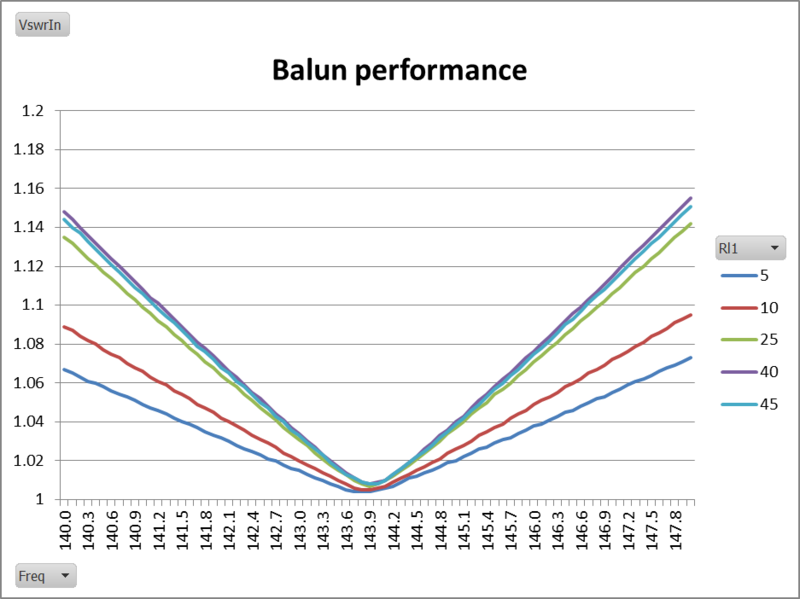 Analyses of current baluns are often done with simplistic loads. A classic case is (Sevick 2001) who explains how a 4:1 Guanella balun on a shared magnetic circuit works for "floating loads". In a two terminal floating load (meaning one with no earth connection, the current into one terminal MUST equal the current out of the other terminal, there is no other path. Another way of looking at it is that if you have a two terminal floating load as discussed at length by Sevick, you don't need a current balun as there can be no common mode current. A more general load is a three terminal equivalent with two terminals representing the feed terminals and the third terminal grounded. A delta equivalent circuit would have an impedance element between each of the three terminals. In this analysis, the balun is analysed for a set of asymmetric two component resistive loads at frequencies from 140 to 148MHz. This is equivalent to the delta circuit with the impedance element between the feed point terminals made infinite. This is a conservative approach, a current path directly from a feed terminal to the other feed terminal carries only differential current and does not tax the balun's capacity to minimise common mode current. The line sections are tuned for 144MHz. 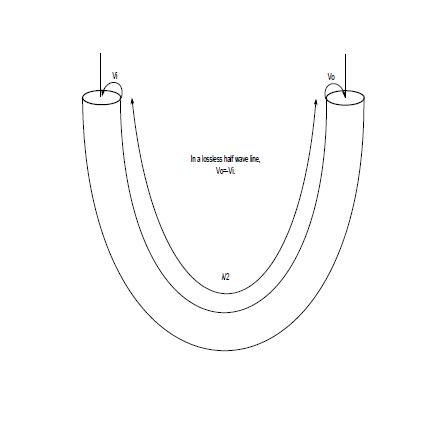 Since this type of balun is most likely to be used on an approximately matched, and approximately symmetric load, the test scenario comprises Z1(Fig 3)=5, 10, 25 and 40Ω, and Z2=50-Z1. Fig 4 shows the level of common mode current in dB relative to the differential current. It can be seen that the effectiveness in preventing common mode current is dependent on load symmetry. 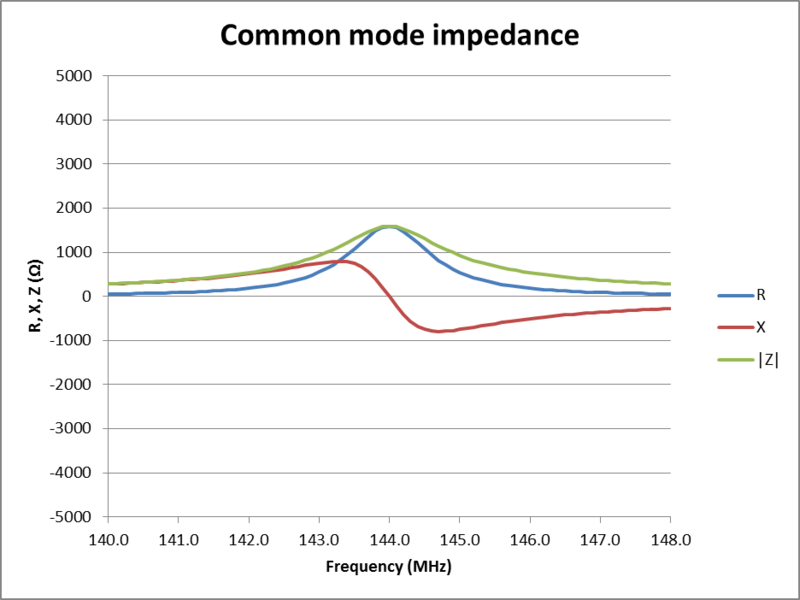 For many applications, the load will be near symmetric, and common mode current is less than -45dB for 2MHz bandwidth. Fig 5 shows the variation in input VSWR for the test scenario. It can be seen that when Zo for the quarter wave sections equals Z1+Z2, the device is a 1:1 impedance transformer. 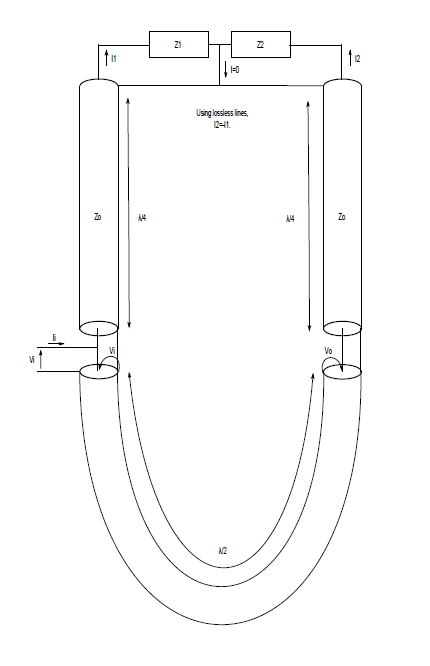 Other transformation ratios can be created using different Zo and Zload (eg 38Ω line sections formed of parallel 75Ω lines could be used to transform a 28Ω feed point to 50Ω). The balun is clearly a narrow band device, but used with a narrow band antenna such as a long Yagi, the Yagi will dominate the restricted bandwidth, or in other words, the balun would not unduly reduce the bandwidth of a long Yagi. Fig 6 shows the loss additional to a direct connection using quarter wave of LMR-400. Again, the extra loss is dependent on the load symmetry, but it is in all cases, quite small. 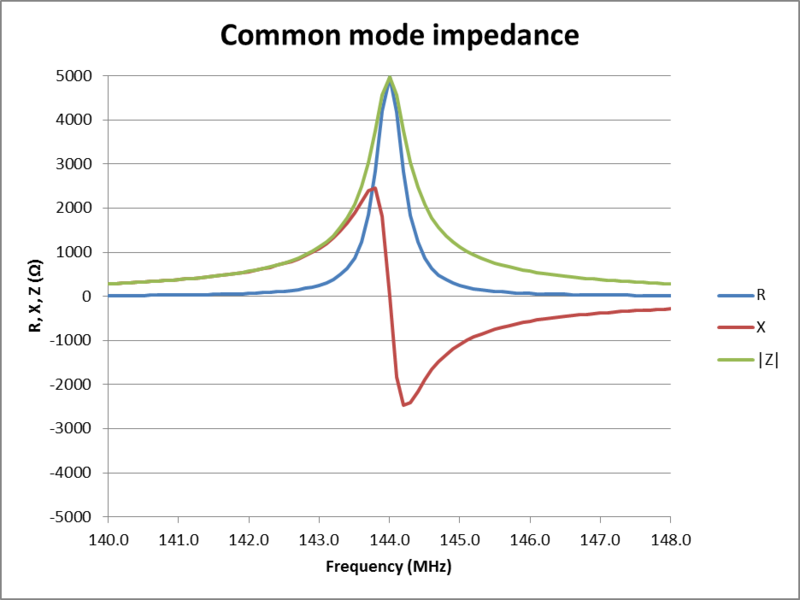 Fig 7 shows the calculated common mode impedance of the LMR400 balun used for the above analysis. Zcm peaks at quite a high value, but its Zcm bandwidth is quite narrow though quite suited to use on a 'DX' Yagi tuned for operation over the low 300kHz of the band. 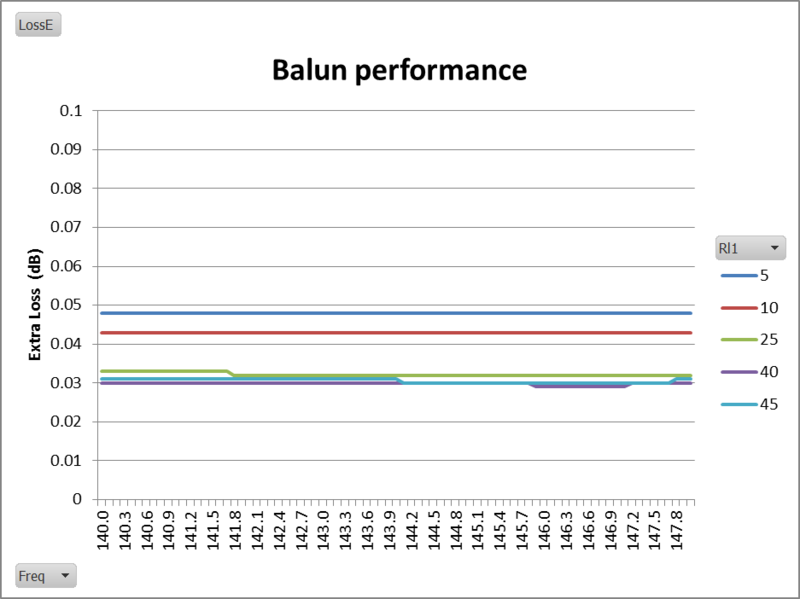 Though (SIlver 2012) claims 10% bandwidth, this balun is clearly not good for anything near that, perhaps more like 2%. Fig 8 shows the same balun but using RG58C/U. It can be seen that Zcm is now only moderate, though adequate for most Yagis. There are many articles on the Internet showing feed systems for a 144MHz Yagi using RG58 sized cable. Fig 9 shows Zcm for such a balun using RG58C/U tuned for 14.1MHz. Zcm is low, and bandwidth is poor... overall, a poor balun. Nevertheless, there are Internet postings recommending this type of balun from 160m to 10m. An example worked up for 160m required LDF5-50A (150m in total) for adequate Zcm, and had 20kHz bandwidth... not very practical. Most documented implementations appear to leave the shield ends at the balanced terminals floating. The supporting argument being that since the balun forces equal magnitude opposite phase currents in the terminals, that there can be no common mode current. Nevertheless, there can be external excitation of the outer surface of the coaxial lines and it would seem good practice in many if not most applications to equi-potential bond the shields to a reference or neutral conductor such as the conductive boom if a Yagi antenna. There is no magic to the design, and it is capable of analysis. The construction does make an effective current balun provided line loss is sufficiently low. 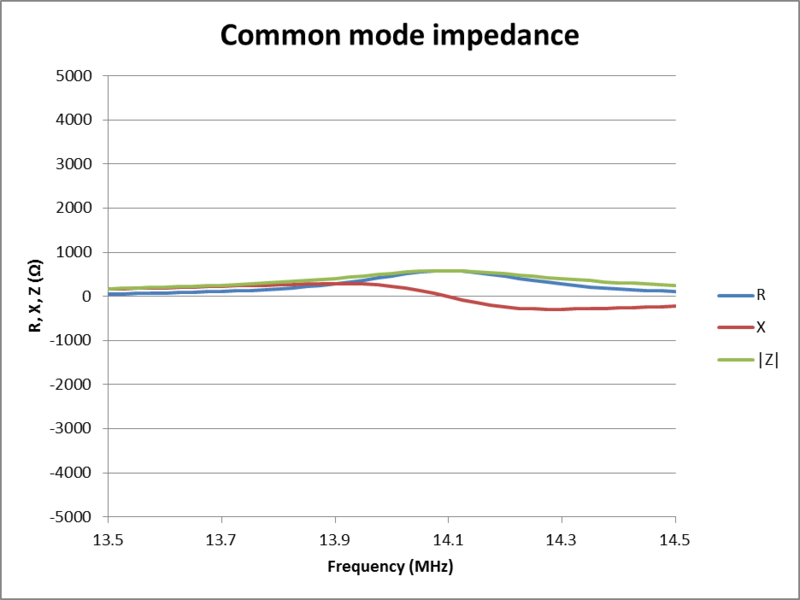 Common mode impedance can be quite high provided line loss is sufficiently low. Bandwidth is narrow, again loss dependent, but insufficient to cover many ham bands. Duffy, O. Jul 2010. A simple explanation of the so called current forcing property of a quarter wave transmission line https://owenduffy.net/antenna/misc/CurrentForcingQW.htm (accessed 25/08/12). ———. Mar 2011. 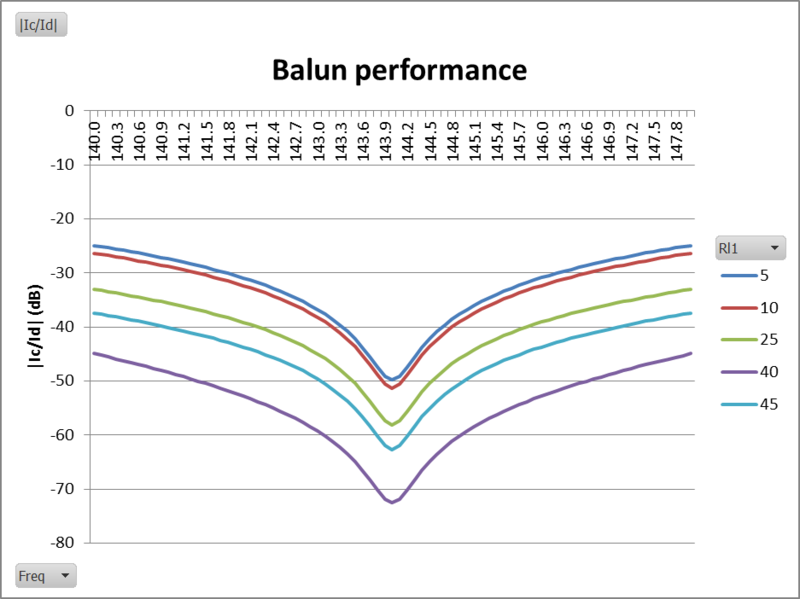 Definition: Current Balun, Voltage Balun http://www.vk1od.net/balun/concept/VoltageCurrent.htm (accessed 25/08/12). ———. Aug 2012. 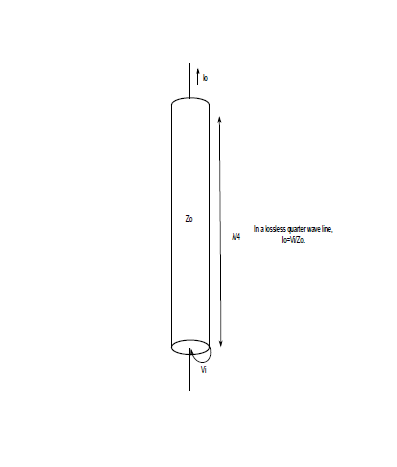 A simple explanation of the voltage forcing property of a half wave transmission line https://owenduffy.net/antenna/misc/VoltageForcingHW.htm (accessed 25/08/12). Sevick, J. 2001. Transmission line transformers 4th Ed. Noble Publishing Co. p9.15. Silver, W. Sep 2012. Hands-on radio in QST Sep 2012. p57-58. ———. Dec 2012(b). Hands-on radio in QST Sep 2012. p49-50.